Psychedelia-the range of sensations, epiphanies, and hallucinations induced by chemical stimulants-was an epochal cultural phenomenal of the 1960s; in retrospect, it seems not only a key component of the decade's sensibility, but an apt symbol of the 1960s reordering of social, political, and artistic structures. It was inevitable that fashion and psychedelic experience would go hand-in-hand since one of the effects of an LSD [lysergic acid diethylamide) "trip" was a heightened appreciation of color, texture, and line. Psychedelic fashion did more than evoke or pay tribute to the mind-alerting experience; it became a way to enhance participation. Given that the LSD-popularly called acid-experience involved erasing discreet boundaries, it was appropriate to dress in clothes that enhanced the ability of the communicant to merge into an experience that for many became nearly sacerdotal rite. Partaking of LSD was central to the hippie credo, and the outlandish clothes of the hippies disseminated the psychedelic sensibility. Flowing shapes seemed to relate to the unbinding of restrictions unloosed by the hallucinogenic experience. 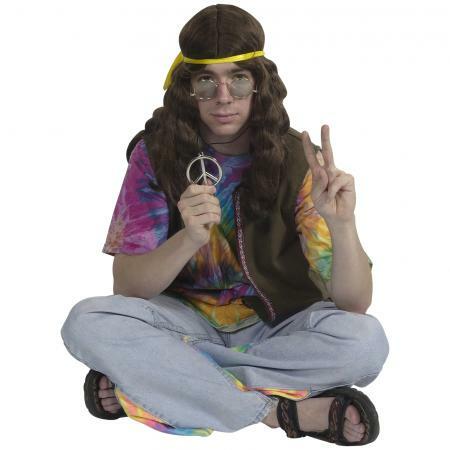 The prevalence of tactile fabrics in hippie fashions spoke to the sense-enhancing properties of the acid trip. Most visible were its innovations in palette and imagery: equally provocative vibrating patterns and colors. Certain traditional motifs-the amoebalike crawl of Indian paisley, for example-were appropriated as psychedelic imagery. The accoutrements included face painting in Day-glo neon colors that recreated the incandescence of acid chimeras. But the principal topos of psychedelic fashion were portraits of light as it was fractured, made mobile by the lens of the acid trip. The awakened kineticism of light made flat surfaces seem to churn and roil. Colors bled, emulsified, and merged kaleidoscopically. LSD existed for thirty years before reaching the widespread cultural acceptance and curiosity it aroused during the 1960s. Similarly, slightly before the apogee of psychedelic fashion in the mid to late 1960s, fashion inspired by the oscillatory geometries of op art deployed a pleasurable hoodwinking of perceptual faculties. Psychedelic experience and psychedelic fashion's incongruous reshuffling of identifiable reference points recalled surrealistic art and Dada, which also were the progenitors to some extent of pop art. Pop art functioned in the 1960s as its own sometimes surreal rebuke to nonrepresentational abstract expressionism. Psychedelic fashion became a way for external reality to seemingly be transformed by the visions projected on the mind's internal screen. Psychedelic fashions existed within a cultural context that encompassed the radical lifestyles of the hippies, the transcendent "acid" experience as well as constructed environments that sought to simulate the acid experience. These encompassed communal affirmations such as the "be-in," and performance art "happenings." Psychedelic fashion became an indispensable component of the total environment created in discotheques or rock palaces; it allowed an integration of the reformed environment and the remade self. The dereglement de tous les sens that Artur Rimbaud had once propounded, was heightened orally by the fuzz box and "wah-wah" pedal distortions. Light shows at the rock concerts and at the discotheque hurled pulsating apparitions at the spectator. The blinking strobe light atomized the continuity, the gestalt of visual perception. It might be said that under the strobe light, all fashion became psychedelic. 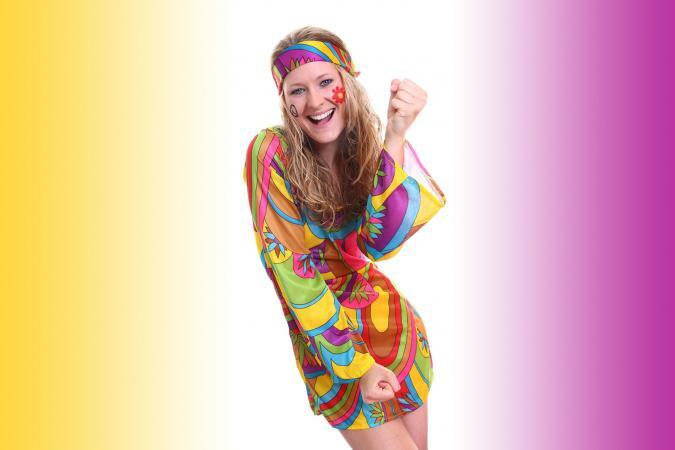 Psychedelic fashion was a quintessential 1960s movement. Although it was eventually, and to some degree opportunistically, embraced by virtually every mainstream design and sector of the fashion industry, it would be hard to isolated a single designer or even a cluster of designers who could be credited for its invention or promotion. Nevertheless, the psychedelic preoccupation with light and the total environment reached a paradigm at the Manhattan boutique Paraphernalia in 1966, when electrical engineer Diana Dew devised a vinyl dress that turned-on at the command of the wearer. A miniaturized potentiometer fit on the belt of the dress and regulated the frequency of the blinking hearts or stars, which could be coordinated to the throbbing beat of the disco soundtrack. That same year, Yves Saint Laurent brought psychedelic light and color to pop art's disembodied trademarks with a bridal gown that flashed an incandescent flower, which enlivened the runway show's traditional finale. Psychedelic sensibility was essential to the second phase of 1960s' fashion vocabulary, the move away from some of the sleeker and brusquer characteristics of mod fashion. It was consanguineous with the second phase's absorption of folk and tribal lexicon, the experimentation in role playing and persona construction made possible by the improvised costumes adopted by youth cultures and spilling out into the Western world's clothes-wearing population at large. The unprecedented outfits certainly owed something to the phantasmagoria of acid visions. Tribal and psychedelic converged with mottled patterns of African and Indonesian fabrics, the phosphorescent splotches and showers of tie-dye. Psychedelic fashion was a grass-roots groundswell, a radically demotic movement that eventually generated a ubiquitous acknowledgment. In New York, for example, one could buy made-to-order tie-dye ensembles at both The Fur Balloon on West 4th Street in Greenwich Village and at Halston's salon on East 68th Street on the Upper East Side. Ultimately, the lexicon and the fashion became degraded. New adjectives introduced into colloquial language and the language of fashion, "psychedelic" and "trippy" among them, no longer retained their original referents but became generic adjectives of approval. Psychedelia not only offered the keys to the cosmos but became the latest marketing ploy. "Call it psychedelic and it will sell fast, some merchants say," was a page-one headline on The Wall Street Journal in 1968. Psychedelic fashion petered out in the early 1970s, partly from overkill and over-exposure, and partly from the changing zeitgeist. Yet it remained popular with students until enjoying a full-scale revival in the mid-1980s, and has continued as a recurring motif. See also Art and Fashion; Paisley; Yves Saint Laurent; Subcultures. Lobenthal, Joel. Radical Rags: Fashions of the Sixties. New York: Abbeville Press, 1990. Masters, Robert E. L., and Jean Houston. Psychedelic Art. New York: Grove Press, 1968.